January 2018 seems like just yesterday in some ways—and like a long time ago in others. As I look back and ahead, here in the middle of the year, I see several trends. My one-little-word for 2018 is FOCUS. I began to put that word into action early in the year by cutting out some activities and routines. One of them, you Poetry Fridayers may have noticed, was to withdraw from posting a weekly poem and linking up with Poetry Fridays. Indeed, my poetry-writing has taken a back seat to other things this year. The interest in doodling, drawing, and lettering that was ignited when I discovered Bible art journaling last spring, has continued to grow. Joining Instagram earlier this year (@vi_nez), has challenged me to grow even more as I’ve discovered amazing artists whose work I admire. It seems to me that at some level, drawing uses similar mental, emotional and intellectual brain pathways as writing (especially writing poetry) and so my urge to create has been absorbed in this new-to-me art form. In June I took part in a flower-drawing challenge (we were given the names of 15 flowers to draw; lettering/words were at our discretion if at all). I chose a Christian quality as a title for each of my flowers. Here are four that I did. One writing project that I continue to work on is a novel—a sequel to the Bible fiction I published in 2012. That book (Destiny’s Hands) fictionalizes the story of the Bible character Bezalel. He was singled out for the job of making the Tabernacle and crafting all its worship accessories (along with many helpers—see Exodus 31:1-11). In Destiny’s Hands, I follow Bezalel from the Egyptian craft guild, where he works for Pharaoh, to the time he receives his assignment from Moses. In the sequel (my working title is Under the Cloud), I follow his sister (a purely fictional character) through the rest of the exodus, taking her and her family to the border of the Promised Land. I’ve worked on this project for several years and still don’t feel I’ve researched enough. But a while ago I decided enough of that, better get writing. I am about two thirds of the way through (53,000 words Monday) what I’ve planned. I’ve been beavering away at that project for most of this winter, doing 90 minutes a day four days a week. During the summer months I’m going to shelve that project but am determined to take it down again when we get back from our travels. My goal, at this point, is to simply finish a first draft. It may never get published, but I will finish writing it. Our summer vacationing starts next week with trips planned to see our children and grandchildren and hopefully take a meander through Canada’s maritime provinces after the summer rush. We’ll see. Early in the year I was part of an artist mentoring group. In that group we were encouraged to create a vision board. Here is a photo of mine. It addresses various aspects of life and I think it might be time to update it. This post is part of Spiritual Journey Thursday, a link-up with other bloggers who write about their lives and work from a spiritual perspective. Doraine Bennett is hosting our link-up this month. Visit her at her blog Dori Reads. Welcome to my online portfolio of poems along with other poetic goodies. 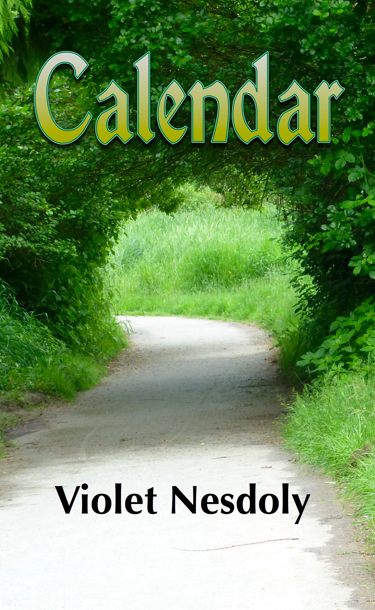 Calendar is now available as a FREE ebook! Click on image for details. All poems and copyrighted photographs are the property of the author and may be used only with written permission.